The type of cancer that Kenny battled was called sarcoma, specifically angiosarcoma. A “sarcoma” is a type of cancer that develops from certain tissues. There are 2 main types of sarcoma: bone sarcomas and soft tissue sarcomas. They can be found in any part of the body. Most of them develop in the arms or legs, but can also be found in the trunk, head, neck area and internal organs. "Sarcoma" is often represented by yellow ribbons and sunflowers, which is why we have adapted the yellow ribbon into this foundation's logo. 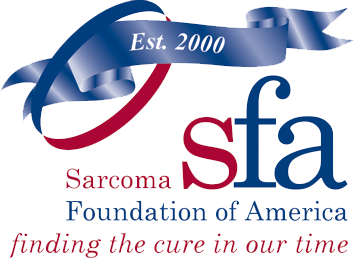 Sarcoma is a cancer of the connective tissue (bones, muscles, fat, nerves, and tendons) affecting about 12,000 Americans annually. In adults, sarcoma represents 1 percent of all newly diagnosed cancers, but 15 percent of all pediatric cancers. Early detection and aggressive treatment can cure these cancers in up to 70 percent of patients, but Dr. DiCaprio said survival rates have been flat and there is little dedicated to research because of the relatively few number of people affected. “It’s a disease that just doesn’t get any attention,” Dr. Matthew DiCaprio, M.D. said. At the Ken Pribil Jr. Foundation, Ltd., we are looking to change just that! Let's bring awareness to Sarcoma Cancer and fund research that allows it to be diagnosed sooner. Sarcomas are not common tumors. “Angiosarcoma” is type of sarcoma in which a malignant tumor that can develop either from blood vessels or lymph vessels. Approximately 25% of angiosarcomas are found in deep tissue. In most cases, the cause of a sarcoma is unknown. Angiosarcoma can also occur due to radiation exposure or treatment, and has been associated with carcinogens. Most angiosarcomas are high grade tumors that are aggressive and fast-growing. Unfortunately, many angiosarcoma patients are diagnosed after the disease has spread throughout the body, and this late diagnosis results in a poor prognosis. Angiosarcoma is a rare and very deadly cancer that can affect many soft tissue areas, originating in the liver, breast, spleen, bone, or heart. The disease is consists of malignant cells that rapidly grow and reproduce themselves by infiltrating cells in blood vessels and the lining of blood-filled spaces in the body. Angiosarcomas are uncommon malignant neoplasms characterized by rapidly proliferating, extensively infiltrating anaplastic cells derived from blood vessels and lining irregular, blood-filled spaces. Heart angiosarcoma can be asymptomatic for a long time or they can present with symptoms mimicking acute pericarditis, pulmonary embolism, or tricuspid stenosis. In the United States angiosarcomas account for only 1% of all soft tissue cancers. Each year there are only about 60 newly diagnosed cases of soft tissue angiosarcoma. This translates into a less than one in a million chance. Kenny was, indeed, one in a million, but rare cancers, like Sarcoma, make up over 50% of all cancer cases, and YOU can help us to fund promising research studies! Current research suggests that better outcomes are achieved for patients who have smaller tumors that are removed with clear margins. Kenny passed away 7 months after his diagnosis with Angiosarcoma cancer, but we strive to help others to find sarcoma earlier and create better outcomes by funding sarcoma research. This year (2013), we plan to start a Ken Pribil Jr. Foundation, Ltd. Grant for sarcoma cancer research, to be awarded to a medical student at an accredited research facility. Our goal with this grant is to fund research that will help to diagnose sarcoma earlier and potentially lessen sarcoma related illness and death. We look forward to keeping Kenny's memory in our hearts through scholarships and this upcoming research grant in his honor for many years to come! Read more about the Ken Pribil Jr. Sarcoma Cancer Research Grant.